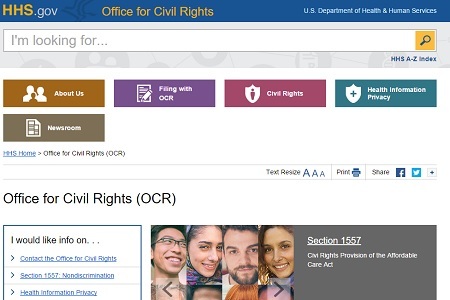 The Department of Health and Human Services’ Office for Civil Rights website has been redesigned and upgraded, and features a responsive design and a more user-friendly interface. The redesign was part of the Reimagined HHS.gov initiative. The aim was to create a website that is faster, easier to use, and makes content sharing and syndication much more straightforward. The HHS site-wide overhaul has taken well over a year so far, with the OCR the first HHS department to receive its site upgrade. The upgrade and redesign was conducted in phases, with phase 1 of the project completed in May, 2015. OCRs overhaul was finished on schedule and was made live this week in time for the January 6 launch. The new crisp, clean, and simplistic design presents information clearly, while a fast and powerful search function has been incorporated to ensure visitors can quickly and easily gain access to the information they need. Typing in a search term will offer numerous suggestions based on the most common searches of the site, ensuring the most relevant information can be quickly retrieved. In order to speed up the search function, HHS was required to trim down the site content substantially. Over 154,000 obsolete and outdated files were removed from the site as part of the overhaul. Visitors conducting searches are presented with OCR-specific information at the top of the search results page, with relevant information from other government websites also listed (OIG, CDC, HealthIT, samhsa, his, Etc.). The website is now an easy to use, one-stop-shop for information on Health Information Privacy and Civil Rights. A responsive format was chosen to ensure the website could be easily accessed on the widest possible range of devices. Content is displayed clearly on laptops, desktops, Smartphones, tablets, and mobile devices, regardless of screen-size. The OCR section of the HHS website receives approximately 2 million visitors every year, and includes 8 out of the top 10 most popular pages on the entire HHS site. The OCR site is used by the public, healthcare providers, and other professionals, so it was important to segregate content to make it more relevant for each visitor. Information and resources have been categorized and split into sections for individuals, professionals and providers to make it faster and easier to find the most relevant information. The new design was chosen after extensive research, and development has been guided by web analytics, user surveys, market research and usability testing. HHS also researched similar projects undertaken by digital leaders such as NPR and Wired Magazine.